An innovative idea born out of need. Sujni is the traditional cloth quilt of rural India layered with tattered and shredded pieces of clothes stitched together. It’s used as a quilt in winters and as a mattress in summers. Worldwide disaster wastage is a common phenomenon resulting from a mismatch between what is given and what is needed or due to insensitivities in giving. After the Bihar floods in 2008, the district administration of Saharsa, Bihar had around 30 truckloads of disaster wastage material in a warehouse. They didn’t know what to do with it.. After a series of discussions when we received this material, it also had a big quantity of un-wearable clothes. Sujni emerged as a viable solution to put this cloth to better use. It also solved a bigger issue of bad quality Daan ka Kambal (donated blankets). This experiment of making Sujnis in the villages, first started in Sukhasan village in Madhepura district, Bihar. The positive response from the locals led to the opening of many such Sujni centres across Bihar. 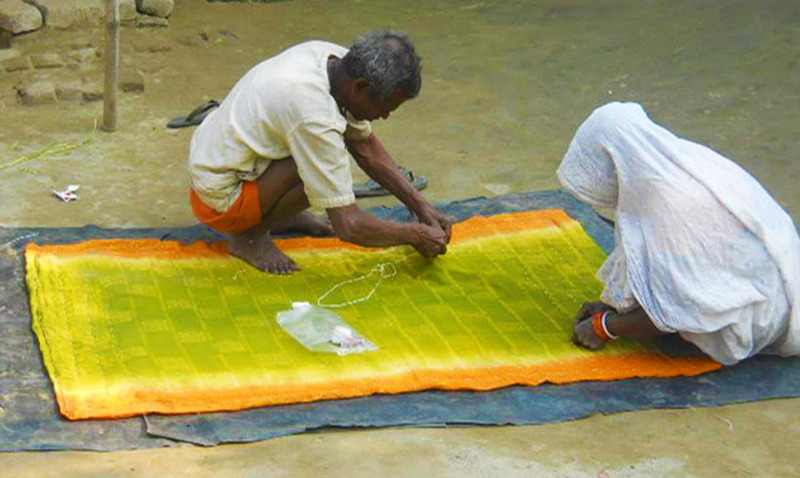 The first recipients of the Sujnis were the differently abled and elderly in the villages where these were made, to help them deal with the severe winter. Soon Goonj started paying for each Sujni making, turning it into a major income generation activity across Bihar. In the first year (2009-10) alone more than 24,000 Sujnis were made by 285 women of four villages (Sukhasan, Tamot Parsa, Forsahi in Madhepura District and Duhabi in the Saharsa district). Started from ₹ 35 then, women are now paid ₹ 50-75 per Sujni. Just after a few days of hands-on training the women can make 5-6 Sujnis a day, earning dignified wages. This successful experiment has now reached Uttarakhand, another disaster spot where we established production units in Rishikesh and Uttarkashi. 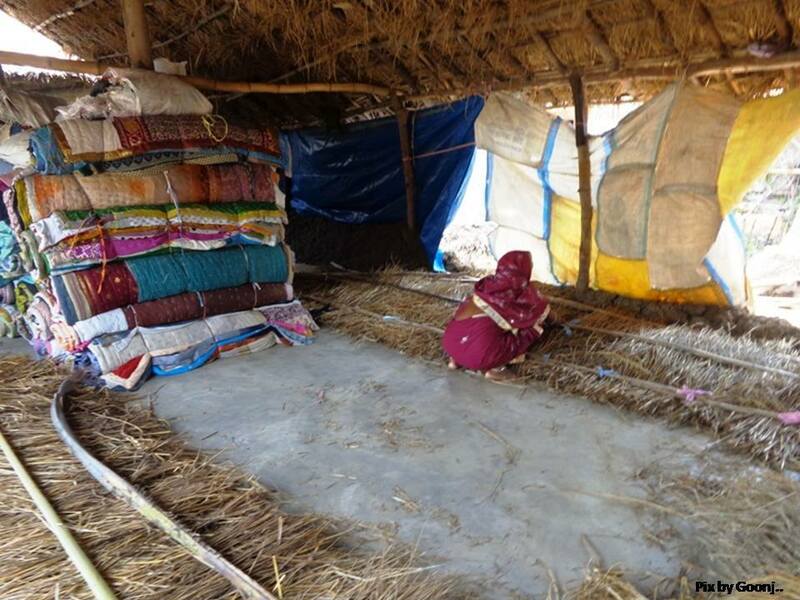 The Sujnis made in Bihar and Uttarakhand are now an integral part of Goonj’s disaster Relief Kit and Winter kit. In the financial year 2016-17 alone more than 300 tons of absolute waste cloth was converted into 54,207 Sujnis and 45,323 Aasans. These Sujnis and Aasans are a major source of livelihood for over 300 women at Goonj’s centres and rural families in Uttarakhand, Bihar and now in Tamil Nadu also. In the last few years since we started making Sujnis, Goonj has been able to convert over a million kilograms of last shreds of clothes and ultimate discard into a very valuable product and in a major livelihood source in the shape of Sujnis and Aasans. “Our village took on the Sujni project in 2010. 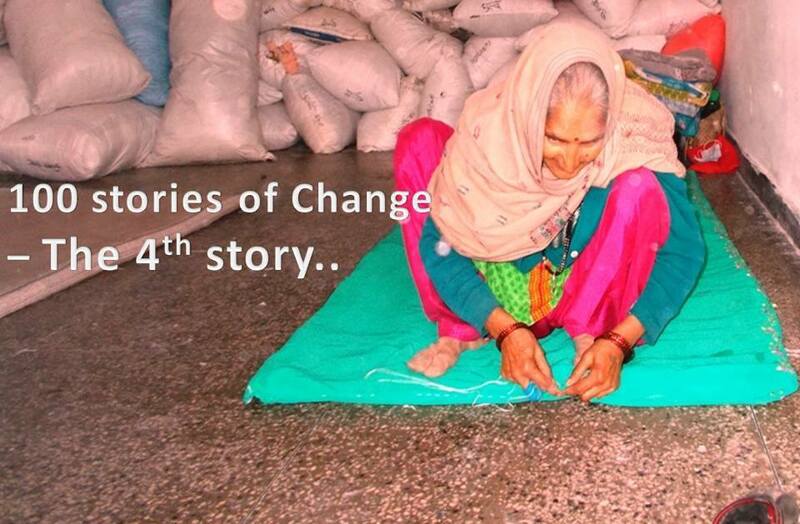 When the project was active, we’d get raw materials from Goonj, bags full of clothes. The men sat next to the women and we all sewed the Sujnis together, which is uncommon! We were very happy when the project was running because we could earn a living. Our families have greatly changed. We were able to save money, and now we manage living in a better way. We are also able to send our children to school.” Bodhi Ram, Kal Devi, Gaia Ram, Mahmudda Village, Bihar.